Throughout history, board games have been a source of entertainment, education and familial bonding across a wide variety of cultures. While some boardgames are purely based on luck, others require extensive skill and learning for anyone to be able to compete with an experienced player. Many games have even become computerized and continue to be the inspiration for many computer games to come in the future. Yet, while these boardgames have become a sole means of entertainment today, many of them were created with entirely different purposes in mind. 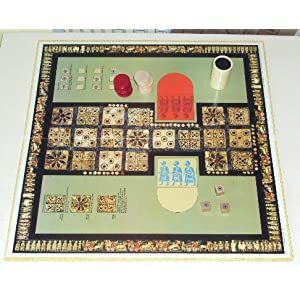 The oldest known board game originated in Egypt around 3500 BC – and is now known as the game of Senet. While the original rules are a mystery to historians, adapted rules have been created for modern versions of the game today. It is believed that the game had a strong element of luck and the Egyptian belief in determinism led many to believe that the gods were protecting and guiding any successful player. Senet boards were found in many burials throughout Egypt alongside other objects that were meant to protect the person from the dangers of the afterlife. 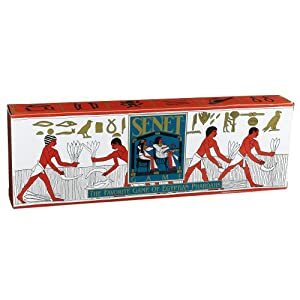 You can still buy Senet games, so if you want to get really DEEP into your board games history, check it out! Throughout Mesopotamia, around 2600 BC, The Royal Game of Ur gained immense popularity. Like Senet, The Royal Game of Ur is still played today, but nobody is sure of the original rules. Historians believe that both Senet and The Royal Game of Ur are precursors to the game of Backgammon and were race games that were highly based on luck. One of the earliest games of skill played on a board is the Chinese game of Go, which likely originated in the 5th century BC. Some legends claim that the game was created by Shun – the counselor of Emperor Yao – in an attempt to favorably influence the Emperor’s unruly son; while others believe that it was derived from the method Chinese warlords used of placing stones on a map to mark enemy fortifications and movements. The game was more popular among the aristocracy than the common people and Chinese scholars were required to play the game to increase their tactical abilities. The official game of Go uses a grid of 19 x 19 lines, but beginners were known to train on smaller boards, where the same rules applied. Two players would take turns placing stones on the grid, with the intention of surrounding the opponent’s stones. Once a stone was placed on the board, it could not be moved unless it was “killed” due to being surrounded by the opponent’s pieces. In order for a stone or chain of stones to remain on the board, at least one of the stones must have a “liberty”, which is essentially an unclaimed space that it is connected to. At the end of the game, a winner is determined either by territory scoring or area scoring, depending on the rules that are being used, but both methods almost always point to the same winner. The original method was the area scoring method, which tallied the points a player’s stones occupied and surrounded. Territory scoring tallies the amount of stones each player captured along with the empty points that the stones surround. Although Go still maintains widespread popularity in East Asia to this day, it never gained too much traction in the western world. In the early 1900s, the game began to spread throughout Germany, but its spread was halted during World War II. In 1996, the first Go game was played in space between American astronaut Daniel Barry and Japanese astronaut Koichi Wakata. Please leave comments or make updates to this history of board games page. Click here to see part two of the series. My favorite one is Monopoly! Once we were playing this game to 2 days in a row, can you imagine it??!!! To see our achievements take a look at editing services. BTW, thanks for such dedicated work and your great blog! I also have a halloween costumes blog and want to publish one of your article on it if it’s possible? Join in and write your own page! It’s easy to do. How? Simply click here to return to Teaching Games articles. Previous post: Board Game T-Shirts Make Awesome Board Game Gifts!